Get a grip: The quest to improve traditional gaming on switch joy cons. It has been a few month since Nintendo released their new console to part skepticism and part enthusiasm by press and customers alike, it quickly has taken off as a hot commodity that is still a bit difficult to find although no where near as difficult as the NES classic was. The popularity of the Nintendo Switch is not undeserved but it still has a few oddities that you have to deal with from time to time. 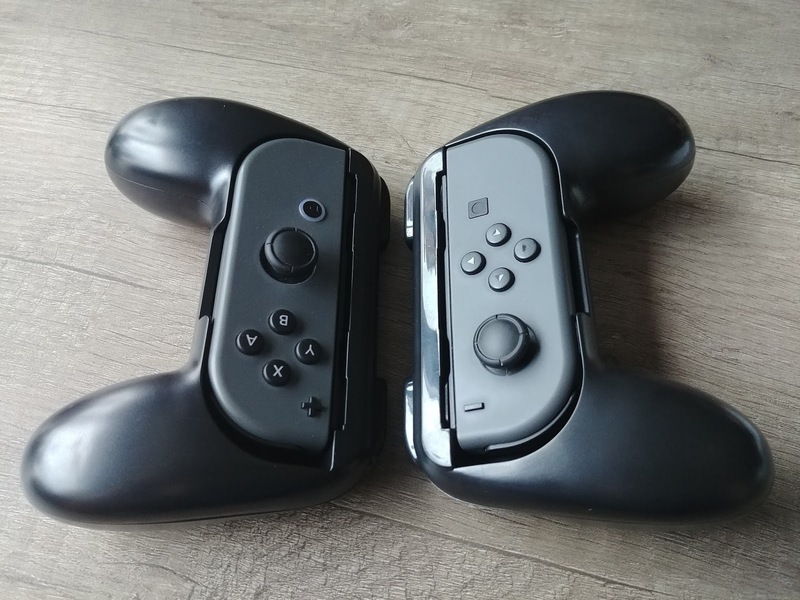 One of those is the small size of the joy-cons. 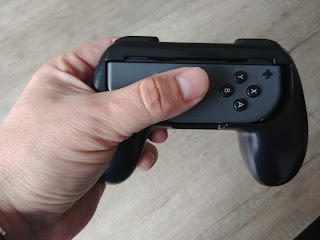 While they perform well enough when attached to the switch itself of with its motion control schemes, such as executed in Splatoon 2, they are less comfortable you want to use them as a traditional controller. 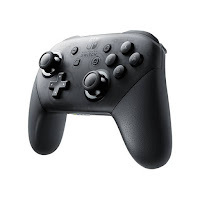 Since Nintendo's pricing structure for controllers is so high that is almost seems to make Apple accessory pricing seem like a steal, it is tempting to get a pro controller instead. Granted the pro controller is fantastic, but again if you want to start a local multiplayer game you do not want to spend that money multiple times over. And your switch already comes with two controllers so it would be great to use them and not feel too much like your gameplay is being gimped. As it would be in our house, kids getting cranky that they have to play with the "lesser" controller and playing with a disadvantage. In addition if you are traveling it might not be so easy to cary around a bunch of large controllers and it is much easier to just use the joy cons to partake in impromptu gaming wherever you are. In an effort to improved the experiences I looked around for alternatives and I found there are a good amount of 3rd party offers that promise to do such a thing. So I ordered one , from Amazon. These Controller Grips from Dobe, are clearly not an official Nintendo licensed product, as the comment "For N-Switch" gives away. 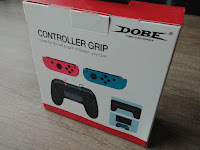 But for the low price of $9.99 for two of these grips combined with Amazon prime it is a price point that allows a small leap of faith (more like a hop, really). The box is simple and can barely fit the two grips, each wrapped in a thin foam layer. No fancy packaging, but we throw that away, no need to pay more for a pretty box. 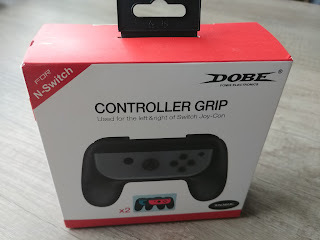 It was surprising for me to discover that the grips are made from a hard plastic. 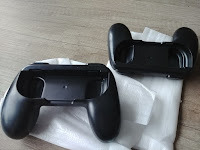 I was expecting something more rubbery, being that hard plastic makes them a bit harder to take on travel and I am not sure they can survive a large impact or something heavy sitting not them. Maybe I was expecting too much for my money? Setup is easy and no instructions are needed. You simply insert the joy-con in the holder and start playing. Be sure to remove the strap if it is attached, because it won't fit otherwise and you will not really need them anyway when using the grips. There is some extra space around the controllers that looks a little off. But they fit in snug enough to not easily fall out during use. The grip allows you access to the shoulder buttons, the thumbstick and the face buttons as well as the -/+ symbols. crampy. It also adds just a little amount of weight to them, making them feel a bit more solid when playing. There are some small problems such as some response issues with the shoulder buttons. At times I had to push a little hard to get it to work, other times it was fine. 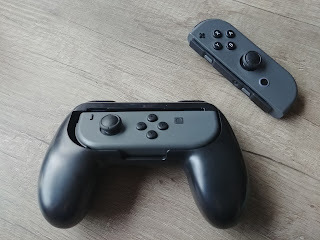 And the placement of the thumbsticks feels a bit weird on the joy-cons and even though that is Nintendo's design, it seems to get a bit exaggerated when you add the grips. For the final verdict on this product I must say I am very happy with these little grips. They make it more fun to play and feel more fair to use in local multiplayer games such as Mario Kart and ARMs. My preference would be for them to be either made from rubber or a more solid material then they do currently, because I would like to bring them on travel without worry they break ( so far travel with them went fine but I always worry). As mentioned they are also not always as responsive when pressing the shoulder buttons and there could be some improvement in this front. But as an overall product , including the great price I would say it is a worthy addition to have around the house or in you suitcase while on travel for those spontaneous multiplayer sessions with friends.